Usually when the hottest starting pitchers in baseball match up, something gums up the works and the anticipated duel comes up a little shy of expectations. 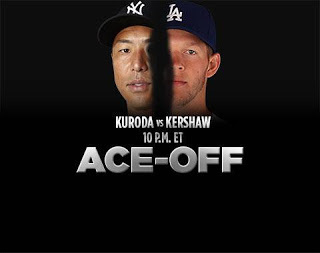 This was decidedly not the case on Wednesday night as the game went to script with former teammates Hiroki Kuroda and Clayton Kershaw throwing zeros at each other all night long. It was a thing of beauty, until the Dodgers screwed up the top of the 9th resulting in a 3-0 Yankees win. Not that I'm complaining. On the surface, the casual observer would look at each starter's 10-6 record and see the potential in the face-off. But beneath the surface, it's hard to find two better pitchers right now. The Kuroda and Kershaw Win-Loss records do not reflect the betrayal from their bullpens or the complete non-support from their offenses. Sure enough they each got no-decisions again last night, mostly because they faced each other. They each gave up some line drives, but they were all hit right at hyper-engaged position players. Kershaw's ERA dropped to a microscopic 1.87 (leading NL), while Kuroda's is now 2.38 (2nd in AL). In July, Kershaw has allowed just 7 runs in 6 starts for a 1.34 ERA. 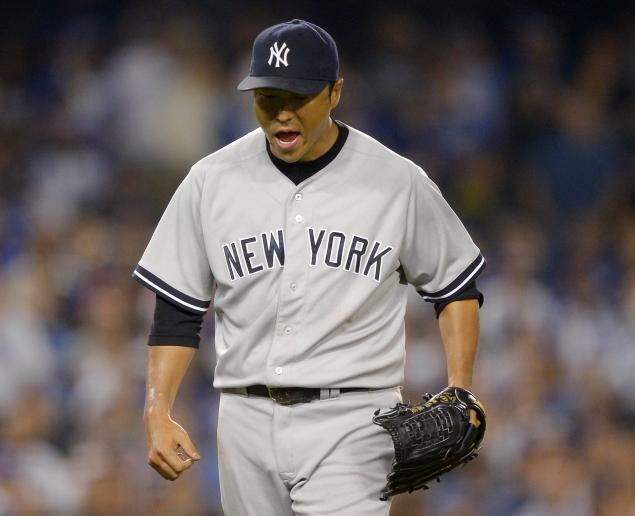 And Kuroda allowed just 2 runs in 5 starts for a 0.55 ERA. In Kuroda's case, he is one of those rare cases where he pitches only once every 5 days, but carries the team. And when he struck out Skip Schumaker with two Dodgers on base to end the 7th, he showed the fire and passion of a veteran leader in any language. Kuroda's 2.38 mark is currently the best by a Yankee starter since Ron Guidry's legendary 1978 season (25-3, 1.74), the best season by any starting pitcher in my lifetime.